There was a change at the D1 leadership position after last games. The most shocking disappointment of round 11 was a defeat of league's leader WA Boufarik (8-5). They were defeated by fourth ranked IRB Arreridj (10-2) 78-74 on Saturday night. IRB Arreridj moved-up to second place. WA Boufarik at the other side dropped to the fifth position with five games lost. They were replaced at the leadership position by CRB Dar El-B.. Very important is a road loss of third ranked USS (9-3) against sixth ranked USMB (8-4) on Saturday night. Visiting USS was defeated by USMB in a tough game in Blida 64-69. USMB moved-up to fourth place. USS at the other side keeps the third position with three games lost. Bottom-ranked Olympi Miliana (0-13) is still winless. This time they could not use their home court advantage losing their 13th consecutive match to ninth ranked USM Alger (6-6) 78-66 on Saturday evening. USM Alger have an impressive series of five victories in a row. Newly promoted USM Alger maintains ninth place with 6-6 record. Loser Olympi Miliana still closes the standings with 13 games lost. 15th ranked RC Constantine (2-11) was outscored at home by leader GS Petroliers (6-0) with the biggest margin this round 88-62. 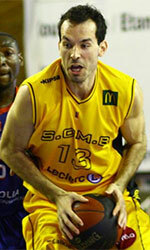 The victory was the fourth consecutive win for GS Petroliers. Defending champion moved-up to eighth place. Newly promoted RC Constantine keeps the fifteenth position with 11 games lost. There were no shocking results in the rest of the games of round 11: Constantine JP was destroyed by NAH Dey on the opponent's court 85-61. Constantine JP unfortunately lost to CRB Dar El-B. in a home game 57-68. OS Arreridj managed to beat El Eulma on the road 70-66. Ouargla was defeated by NAH Dey on its own court 59-72. Olympi Batna was beaten by Staoueli in a road game 77-65. We cannot really consider it an upset in the game between close teams in Alger where 12th ranked Constantine JP (3-9) was crushed by thirteenth ranked NAH Dey (7-6) 85-61. The victory was the third consecutive win for NAH Dey. They moved-up to seventh place. Constantine JP lost their third game in a row. They dropped to the fourteenth position with nine games lost. Very predictable result when second ranked CRB Dar El-B. (10-1) defeated on the road 12th ranked Constantine JP (3-9) 68-57. CRB Dar El-B. keeps a position of league leader. Constantine JP lost their third game in a row. They dropped to the fourteenth place with nine games lost. There was a minor upset in Eleulma where 7th ranked El Eulma (5-7) was defeated by tenth ranked OS Arreridj (5-7) 70-66. Newly promoted OS Arreridj maintains tenth place with 5-7 record, which they share with defeated El Eulma. El Eulma lost their third game in a row. The game between closely ranked teams ended with thirteenth ranked NAH Dey's (7-6) road victory over 14th ranked Ouargla (4-8) 72-59. The victory was the third consecutive win for NAH Dey. They moved-up to seventh place. Ouargla at the other side dropped to the thirteenth position with eight games lost. There was no surprise when 8th ranked Olympi Batna (4-7) was defeated on the road by fifth ranked Staoueli (7-5) 77-65. Despite that victory Staoueli went down to sixth position due to points difference. Olympi Batna at the other side dropped to the twelfth place with seven games lost.